In this tutorial you will learn to create an admin-type user (Mark) that is able to log into both X_RISK and TT User Setup. In addition, you will set up Mark so that he can create new users, assign risk parameters in TT User Setup, publish SODs, and monitor trading via X_RISK. Note: As part of the administrator setup procedure, you should set up an administrator email account for the dissemination of newly generated passwords. For the procedure for setting up such an account, refer to the topic Configuring the Outgoing Email Settings. Assign Mark a Username, Display name, and Password. Click the Administrator Permissions tab, click to select either Super Administrator or Group Administrator. Note: If you select the Group Administrator option, you must assign at least one user group to that group Administrator. Click the X_RISK Properties tab, and then select the X_RISK options as needed. Note: Selecting any of the X_RISK options allows Mark to monitor risk via X_RISK. If you allow Mark to publish manual fills or start-Of-Day records, you can restrict Mark to publishing only to accounts that exist in specified user groups by checking the Restrict X_RISK administrator to publishing ... option. 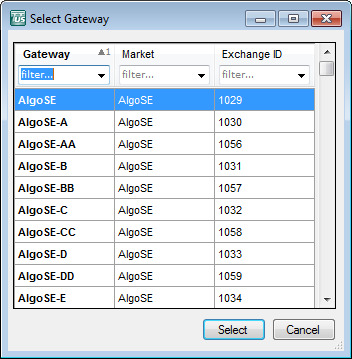 Select the Gateway Logins tab. Note: You may instead select to click the Assign Existing Logins button. 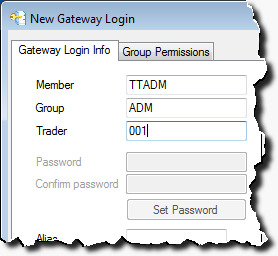 For a detailed description of that procedure, refer to the Assigning Gateway Logins to a User Through the Users Window topic. Enter a Member, Group, and Trader (MGT) ID. Note: Use TTADM for a full admin. Select a Market, a Gateway, and click Select. Repeat this step for each gateway that Mark would log into. Note: For Mark, being a TT User Setup user, the newly created gateway login can be used to log into X_RISK. On the Edit User window, click Save. Mark's new administrator user data appears in the Users window.